"Dee Christopher has managed to found an exciting and original way to introduce a dangerous stage classic to the close-up arena. A marvel idea from an amazing artist." "Gorgeous take on an effect very close to my heart..."
"I love the idea. Great thinking - A practical and cost effective roulette. Excellent!" "Great bit of original thinking mixed in with the prospect of burning things. Double win! Sadly, it always works...so it's terrible for pyromaniacs." Can be performed in any situation. 1 minute set up and you're good for hundreds of performances. I have been performing russian roulette routines on stage for the best part of a decade. I've used spikes, staple guns, power drills, knives and other items. The basic effect is that the performer avoids the dangerous item out of several identical items, for instance, the only cup with a spike under it. These routines are filled with suspense and impact - For a long time I've been searching for a way to create a russian roulette routine in a close up environment, something that could be done in a walk around or table gig. I've seen a few on the market that look like magic tricks, or are illogical. I wanted something that used items that you would carry in your pocket, that looked innocent and that worked EVERY time, no matter the situation. 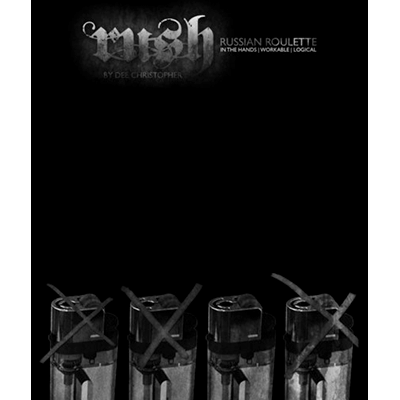 With RUSH, you will be given the secret to creating the perfect close up russian roulette, using several normal disposable lighters. One by one, the spectator will select three of the four lighters to either light under your palm, or to set alight an item of value (such as an envelope with money in it). None of the lighters that they select with work, the only lighter that actually lights is the final one left. Every time. If you work in bars or nightclubs with their own branded lighters, you can easily gimmick their lighters in the bathroom and perform this effect. If you're working a trade show or for a company's party, use their branded lighters. why not have your own lighters printed with your details and give away the final lighter as a business card style souvenir!The effect can be presented as a powerful demonstration of influence of decision, subliminal suggestion, influence of chance, prediction or spectator as mind reader. What ever your angle, this will go in your set.